I'd like to start this post by thanking ALL OF YOU! You've been so very kind and showing us so much love after our announcement of being engaged! It really spiked the already insanely happy state we were in! To know that so many of you are so happy for us is just the cherry on the cake! Now on to the thing many of you have been asking about. My Granny Square Blocking Station!!!. Say what?! 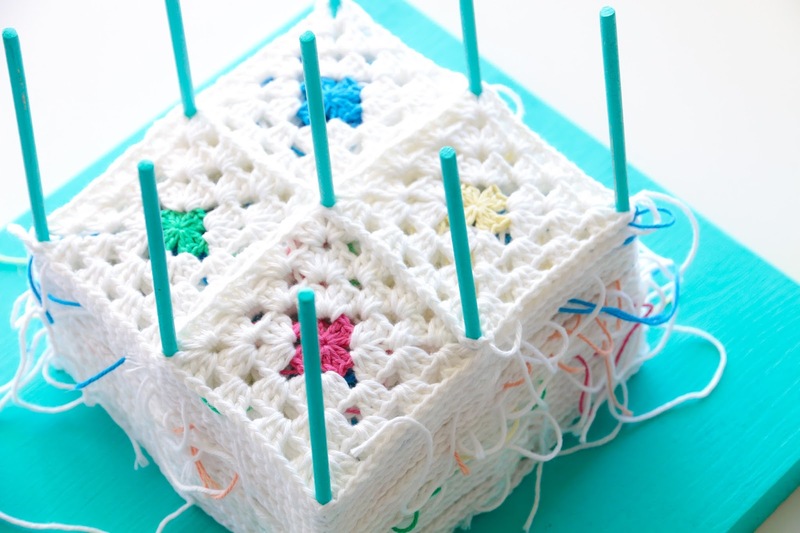 Yes, here at Boys & Bunting we block our Granny Squares! Now when making a blanket made out of granny squares, blocking is often not really crucial, as the squares will pretty much 'auto-block' when they're joined together. So why come up with a blocking station you might ask? Well, being crafty is not always about things you need, but more about things you like. I like to block the squares for the blanket we're working on because it makes the piles so very very neat and makes all the squares look exactly the same! It makes it easier to lay them out and organise the colour layout of the blanket. It also happened because when we started making these squares, Matt's tension turned out to be a lot looser than mine which resulted in bigger squares. I went up a hook size, and adjusted my tension as much as I could but my squares were still a little smaller. The blocking station totally fixed that issue. So far we've only dry blocked our squares. We put them on our GSBS (granny square blocking station) and let them sit there overnight, or as long as you want. When we take them off, they're blocked. This works because it's cotton and cotton tends to change shape quite easily. When using wool you might want to spray your squares with some cold water as you put them on the GSBS. We haven't tried blocking acrylic ones yet, but I'm pretty sure the GSBS will do the trick as well! 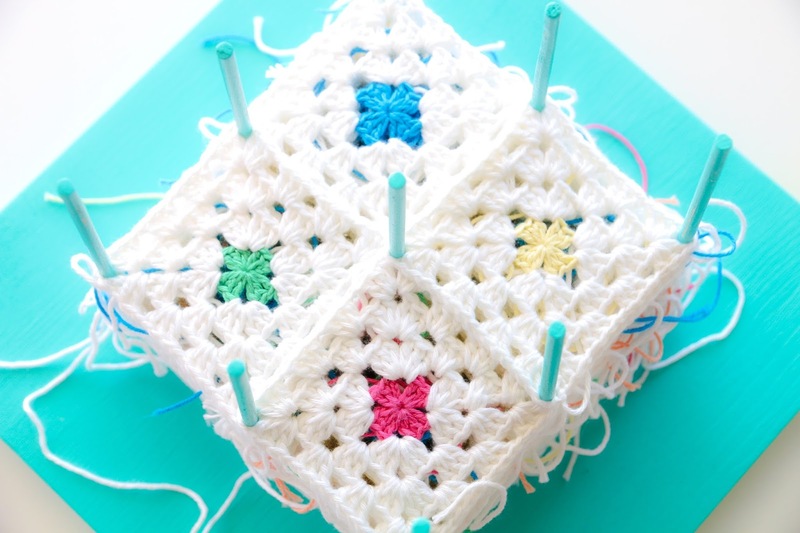 So how does one make this "Granny Square Blocking Station"? Well, it really is very very easy. Now you might think to yourselves: "well, easy for you maybe". No, not just easy for me, easy for everyone. I have pretty much never in my life held a drill or worked with wood. Matt's usually the done doing stuff around the house. So if I can do it, you can too! 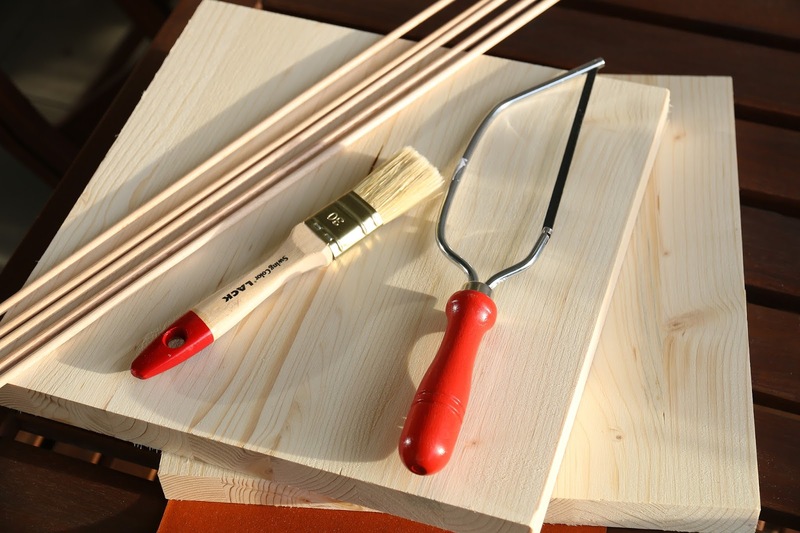 I went to the DIY store to buy some wood, some dowel, a paint brush and a little saw (to cut the dowel). At the wood section they had a sawing service where they also sold left over cuts of wood. One of these boards turned out to be perfect, it only needed to be sawed in half to get 2 perfect squares (I only needed 1). You could however also use wooden chopping board, or any piece of wood that is thick enough. I'd say around 2.5 cm (just under an inch) since it needs to hold the dowel steadily. The pieces of dowel were 5 mm wide and felt quite strong. I needed enough dowel to make 9 pieces of 20 cm each. Mine were 1 meter each, so I needed 2. 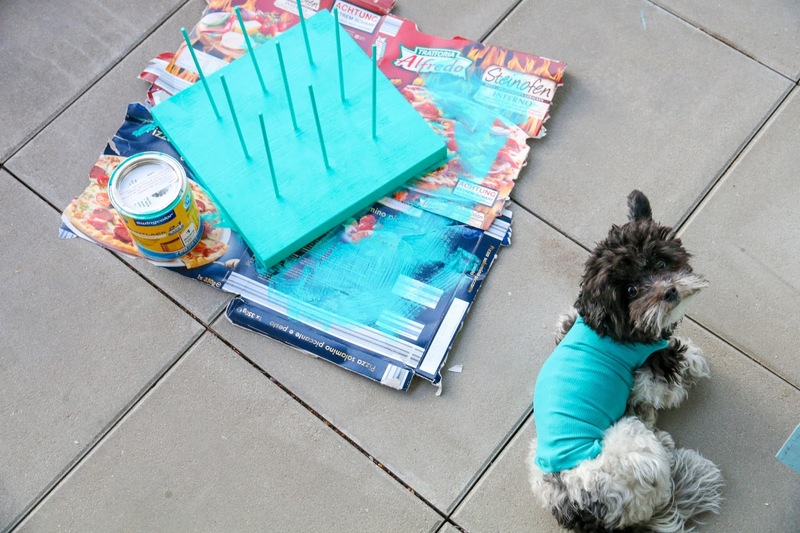 We still had some paint at home from when Matt upcycled a chair he found on the street. A lovely and bright aqua-turquoise color! It totally reminds me of the Caribbean. I sanded the ends of the dowel to make them nice and smooth, i also sanded the entire wooden board, especially the edges. I then measured my granny squares, which were just under 8 cm. I decided to go with 8 cm so they would stretch a little bit. Now on to the drilling! I used a 5 mm drill since I was using 5 mm dowel. The drill is as cheap as it comes, as it's an Ikea one that works with a battery. It drills so slowly that I was lucky that the wood wasn't very hard, since even with a full battery, I had to push on the drill as hard as I could to even get through the wood. Before drilling, you need to to know how deep you can drill. The easiest thing to do is to hold the drill end against the side of your piece of wood to see how far you can go without going through the wood. I drilled about 1.5 cm in leaving 1 cm "undrilled". You can mark your drill by adding a thin piece of colourful tape on your drill at the point where you should stop. This way you will never drill deeper than you should! Now drill those 9 holes! 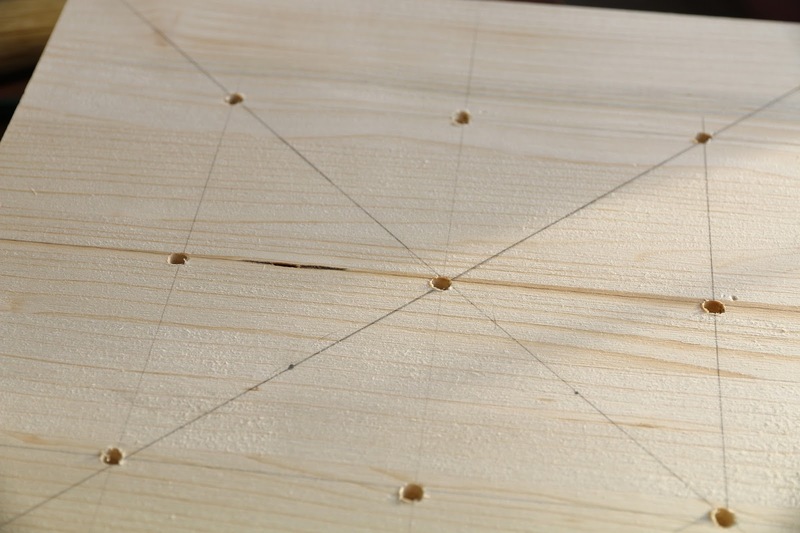 Make sure you hold your drill as straight as you can, since you don't want the pieces of dowel to be crooked afterwards! 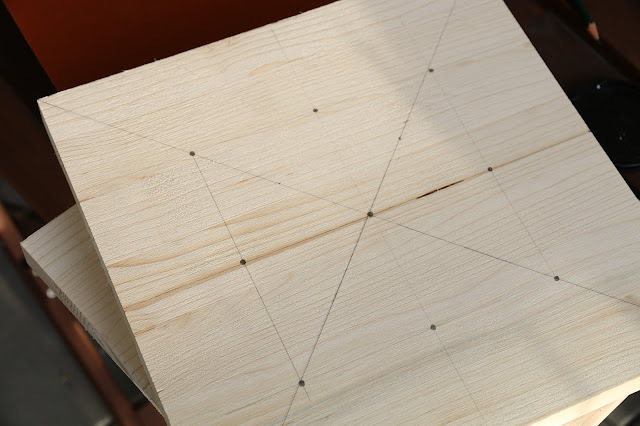 After you're done drilling, check if your pieces of dowel fit inside the holes. It should be a very tight fit, but if it really won't go in, sand one end of the dowel down a little bit more until it fits. I didn't need to do this. It was very very snug! You can leave your blocking board as is, but I decided to give it a nice coat of paint! Like I said before, I chose this beautiful fresh color which is a paint and varnish in one, with very high coverage and also very quick drying. When I was done painting, it was pretty much dry already. I painted the entire board with the dowel in place. I was scared the paint would fill the holes too much and the dowel wouldn't fit inside anymore. I also didn't plan on taking the dowel out since it's not meant to be an adjustable blocking station, so I was fine with the paint gluing the dowel in place. I didn't do a great job painting the sides of the board, and didn't bother with the bottom as well. But I'm very happy with the outcome. I didn't paint Poppy! She just happened to wear a matching outfit! 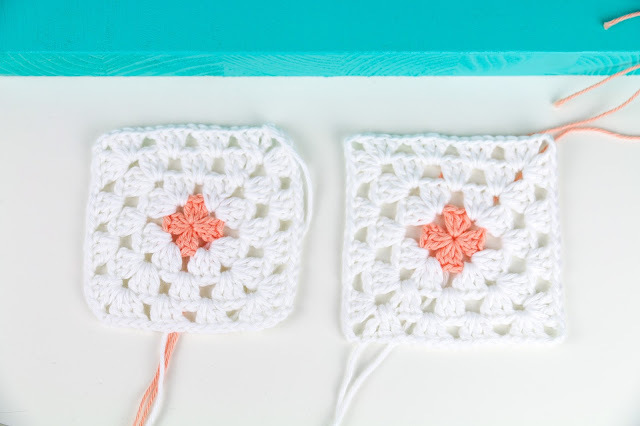 I hope my instructions were clear enough so that you TOO can make a Granny Square Blocking Station! If you do end up making one, please tag us on Instagram with @boysandbunting and #boysandbunting so that we can see your work! This is such a great idea! Will be making one. I have a question! First, great looking station, thank you for sharing! Anywho, your article suggests that you didn't use water to block since the yarn was cotton. Is this correct? I had not heard that before, I thought water was required. Hello Lisa!!! Thank you for your message!!! In case of making doilies and big scarves I'd suggest using water or even starch to achieve the best blocking. 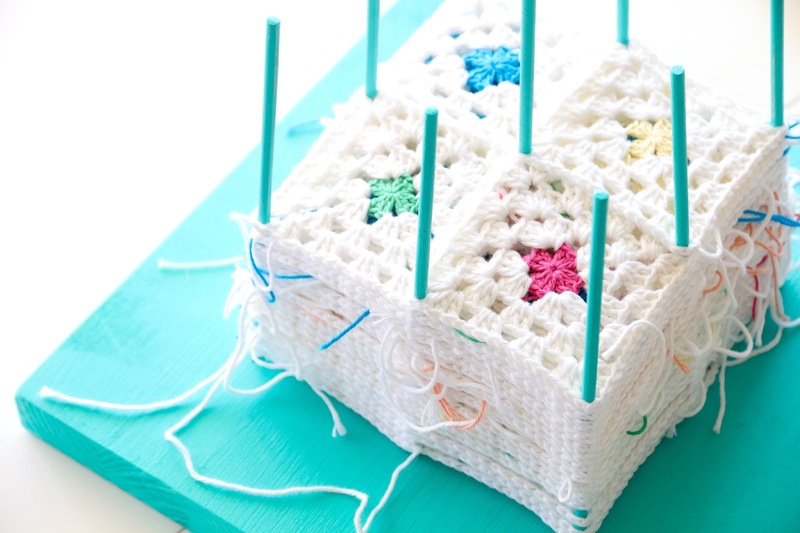 In this case, the small little squares don't require much work to maintain their shape. Especially when they're going to be joined together (they will keep their shape automatically this way). I also expected to be needing water, but the grannies came of the blocking board in perfect shape! Love the pretty white granny squares. Do you have a picture please of the finished blanket. Would like try to make one. Such a great idea! I can't wait to make mine!